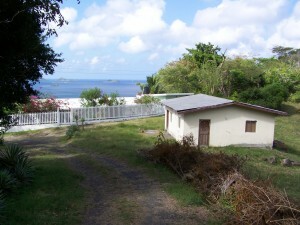 Situated at Prospect, just 20 minutes walk from Anse La Roche beach this 26,452 sq. ft. lot includes a building. Located at Prospect, about 3.5 miles to the north of the main town of Hillsborough along an unpaved Government road, this gently sloping Lot has great potential. It has the benefit of an existing building, which although in need of refurbishment, could provide a storage opportunity during a building project or temporary accommodation. It was originally built as a two bedroom house with bathroom, kitchen and living area. The septic tank remains in place at the back of the house but the cistern has been removed.